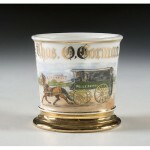 Police mugs are very collectible and desirable and there are many designs that are available within the category. This makes determining prices and values very difficult for new collectors, and even for established collectors. 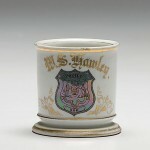 Police mugs are also interesting in that there were many police officers and as public authority figures they were likely to have gotten nicer Occupational mugs, in some cases as gifts from members of the department or public. 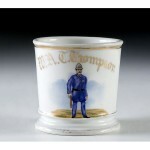 Other cool Police mugs include mugs for well-known or famous lawmen, which are extremely rare. 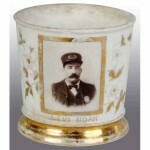 While not always possible, it is often easier to track down biographical information about a former police officer than many other occupations and knowing the who what and where of a mug owner’s life can increase the value of the mug. 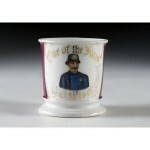 For help with a police officer mug, please contact us for more.